From last month our school (Sita School) has become strictly illegal and technically we are liable for prosecution. Looking back at Education and Language Policies, for example, from the time of Macaulay’s infamous Minute of 1835 there is nothing sacrosanct in such policies which are often shaped by political and economic forces but nevertheless it is hard to feel both accountable in the public sphere and yet not allowed some space for difference. Efforts to have a different kind of recognition – e.g., to strengthen the Basic Education National Open School, have so far not been acceptable despite a number of meetings and petitions to the Ministry of Education. There are certain contradictions: for example, where Sevagram in Wardha has been awarded heritage status and been publicly lauded as a new model, they still face difficulties to get recognition. There are various options for Alternative Schools. Some are survival strategies like registering children in government schools but actually teaching them outside the regular system. Other responses require a re-orientation like starting Learning Centres outside school hours or concentrating only on children above 14 years. Judging by the present trend even these spaces may be closed in the foreseeable future as there are rumours of the government controlling coaching and tuition centres, nursery schools and schooling up to 16 years. The other option is to “lie low” and hope that officialdom is slow in following up illegal schools. None of the above is very satisfactory and many involved in alternative schools would prefer transparency. The RTE Act no doubt was rooted in a genuine concern to create a more equitable and just society, but in the process it has been co-opted often by market forces and a corrupt bureaucracy. It is a long and laborious process which in itself is not the problem but it involves either corruption – I heard recently of a school where the BDO asked for Rs 25,000 for a site visit which is just one of the necessary steps to ensure registration – or the alternative of using ‘influence’ and to gain the support of highly placed people in the government. I was told that one person, who was highly educated, had no choice but to devote almost the whole year to securing this and even she was helped by a number of people. On the other hand, there are innumerable private schools being started which are often connected with local political bodies, religious organizations, or those with doubtful business concerns including real estate dealings who seem to face no problem in securing the necessary recognition presumably because they are not averse to bribery. In all the discussion about quality this seems the least of the concerns of the administration. There are ongoing attempts even to officially postpone, sideline, ignore some of the requirements such as sanitation facilities and space norms. There are fears that this would be the beginning of harassment through other kinds of checks and regulations. In complying to some norms there will be only more and more. I was told recently that in Kerala the government is considering making ‘no objection’ certificates mandatory every year, whereas earlier it had been required only once at the initial stage. Also, there are suggestions that local political figures will play a more significant role in the Parents and Community Councils. Our teachers who have been working for more than 25 years do not have the required qualifications. Exploring meaningful teacher training courses that are feasible for working teachers, for example – The Azim Premji University is proposing a Blended Programme for in-service teachers but this is not likely to begin before 2014. There are other options through Distance Learning Programmes which are often meaningless in themselves but provide the necessary certification. Sita school is structured in vertical grouping and therefore does not follow the required norm of being in fixed age appropriate classes. This is a deliberate choice and part of a framework that fosters collaboration and co-operation. This is one of the aspects that differences should be allowed to flourish and should not be controlled by a single policy. This is only one example of control but admission, curriculum, and assessment decisions are likely to be more regulated by those who are not necessarily concerned with the welfare and education of children. The growing reality that school is merely a form of certification is becoming almost like an identity form. Recently a student who had failed in the 8th class attended our school for one year. He was barely able to write a sentence in Kannada and had hardly mastered addition facts up to one hundred. The following year he was re-admitted into the 9th class at the local Convent School and we are informed that he will sit as a private student for the SSLC examination so that he will secure a 10th class ‘fail certificate’. It is, of course, to the economic advantage of private schools to admit such children and then totally marginalize them beyond providing a certificate. And there is no way such private schools feel (or asked to feel) accountable. Frustration at a standardization which enables bureaucratic control that does not support different kinds of spaces. Irony in all the discussion about Child Rights that children have no choice about going to school. Abdication of government responsibility to privatization in all spheres: communications, health, energy, teacher training etc. This is reflected in the growing collapse of government schools. 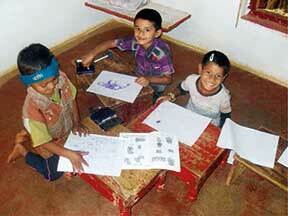 (In September there was a threat of 2510 government schools being closed in Karnataka). This is exacerbated by channelling government funds to support the 25% quota of children in the private system which could have otherwise been used to strengthen the government school system. Further, the neglect of strengthening English as a second language which means an exodus into private English medium schools. A number of alternative schools provide opportunities for students who are outside the mainstream. Examples are night schools in Rajasthan where teachers work tirelessly to support children who are not in school because of economic constraints of the family. There are also innumerable organizations that work with migrant children or children of construction workers and of course children with special needs. Despite the rhetoric about integration and inclusion few schools are equipped or motivated to give these children the care and attention they need. What is happening to Montessori schools or other alternative schools that have evolved their own systems of training? Is there no space for parents to choose the kind of education they want for their children? A number of these schools have contributed to more mainstream education for example, some people connected to alternative schools were involved in drawing up the National Curriculum Framework in various domains. One glimmer of hope is the recent official commitment to vocational schools from the 5th class. It is yet to be seen what this means in practice and whether this will provide a more open space for a different kind of education that nevertheless allows students to move between different streams. Laments about’ the death’ of alternative schools may not be in place and certainly these schools do not have a monopoly on quality education. However there is a need for these concerns to be discussed in public. Otherwise, the government machinery will succeed in pulverizing any small or alternative endeavours that are genuinely committed to inclusive education and evolving practice of quality education. The author has been working in an alternative school near Bengaluru for the last 30 years and has also been involved in sharing resources in art and language with government primary school teachers. She can be reached at jane_sahi@hotmail.com.